The horse to the left is Abdullah, who lived to a ripe old age of 30. Many venerable old racers and sport horses have enjoyed a long life. But 2008 is not a good year to be an equine athlete. It's only June yet many of our best and brightest have crossed the rainbow bridge well before their time. Eight Belles, Frodo, Quiet Man, Teddy, Tigger Too, Task Master. A little further back in time, Le Samurai, Eight St. James Street, and Barbaro left us. I've been thinking about high value horses -- six figures or more -- and what happens when one catastrophically injured. Often the horse has several owners, or a syndicate, and a significant amount of money is at stake. Add the vets, the insurance companies, and public opinion, and the need to make a decision in crisis. Add to that, a love for the animal, and it must seem like a nightmare. Barbaro's owners had mortality insurance, but not major medical. Euthanization would have been both justified and in their financial interest -- but they are affluent. They had the luxury of paying out of their own pocket, and bless them for their gallant efforts to save him. But for most owners of elite sport horses, insurance companies, along with the veterinarian, will advise the owner. If the owner wants to file a valid claim, this advice must be followed. Lloyds of London was the first company to insure a sport horse in 1965, for full mortality. These days, horses can be insured for any number of things -- mortality, fertility, surgical, loss of use, major medical, and travel accidents, to name a few. I'll look only at full mortality and for loss of use. Full mortality premiums for elite animals (think Barbaro) might be as much as 5-10% of the value of the animal. Teddy was rumored to be insured for a million dollars, and Barbaro was insured for a reported 40-50 million. The premium for a million dollar policy would be $50-100,000/year, and for 50 million, a premium of 5 million a year. Loss of use coverage is geared toward loss of use by accident -- illness or degenerative conditions aren't covered. The premium is around 2-3% of the insured value, but the payout is only 50-60% of the animal's insured value. In practice, elite racehorses and other elite athletes are seldom covered for loss of use as it is so risky. "It's just not good business," said an insurance agent in one article. Can they even get insurance? Frankly I'm surprised that racehorses and eventing horses can even get insurance. But I guess they can. Premiums are also higher for certain kinds of sports--although steeplechasers are generally worth less than racehorses, steeplechasing premiums are three times higher than that of flat racers because of the greater risk of injury. Insuring high value sport animals is not a big money maker for insurance companies, and availability of insurance fluctuates. When a large claim is paid out -- such as when the racing stallion Alydar died in his stall-- premiums tend to rise in response. Sometimes for a while after these incidents, it is not possible to get a policy. A Wall Street Journal article reported that insurance companies may start looking at bloodlines before they insure animals. Apparently the Northern Dancer line has had more than its share of injuries, and in the future it may be more costly to insure his offspring. I was surprised to read this -- so MANY race horses have Northern Dancer blood. Many sport horse owners cannot afford the premiums, so they "self insure," which I think translates roughly to "eat the loss." There have been lamentable cases of insurance fraud involving show horses at the highest levels of sport. Whenever possible, insurance companies carefully monitor/supervise the treatment of the injured animals. For any insurance claim to be valid, most companies require advance notification and prior permission for treatment/euthanasia except under the most extreme conditions. In fact they want to be notified of any health issues requiring attention, and claims have been denied because the owners failed to report even minor injuries/conditions. Is the condition chronic and incurable? Has the immediate condition a hopeless prognosis for life? Will the horse require continuous medication for the relief of pain for the remainder of his life? 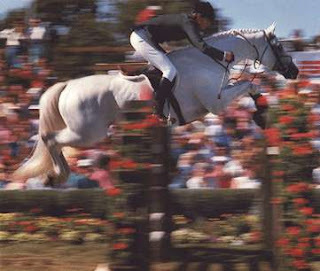 For high value animals, insurance companies require a full post mortem to be done on every horse during a mortality claim, within a certain time frame, and if a horse has been injured at the racetrack, no less than two veterinarians must be present to officially confirm that a horse has been humanely destroyed due to necessity (a horse being in severe untreatable pain or imminent death due to untreatable injuries). I'll admit here that when I first learned of Teddy's death, a little part of me wondered if his injury really warranted euthanasia. Is it possible he could have recovered? Could the financial pressures have influenced the decision to end Teddy's life? I ask this question at a general level (I don't know any of the parties involved). And I can imagine how difficult and awful the situation must have been, and the injury struck me as a possible grey area where perhaps either treatment or euthanasia could be advocated. After reading what I've read about insurance, I feel that there are checks and balances that protect the welfare of the horse. Fascinating! Horse deaths and insurance generate a lot of questions don't they? 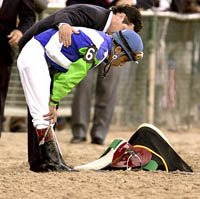 I googled this photo, and it may be from Barbaro's last race -- if someone knows the owner's racing colors perhaps they could confirm? My sense is that the jockey was overwhelmed after a bad accident, perhaps he just set the saddle down.